Many commercial and industrial operations require refrigeration for a multitude of needs and at varying temperature levels. Most notably, the development of refrigeration technology gave rise to a vast food processing industry that changed the eating habits of mankind on a global level. Where once diets were limited to those foods that required no refrigeration or those that could be preserved via smoking or salting, large-scale refrigeration opened opportunities for not only preserving, but also shipping fragile foods over long distances. From cold storage for warehousing beverages and food products to sub-zero refrigeration to freeze and maintain meats, food processors rely on modern refrigeration technology. Food processors and storage facilities are, perhaps, the most obvious beneficiaries of refrigeration, but the products of many other industries also depend on cold temperatures to assure quality and safety. These include ice rinks and ice production, chemical and petrochemical process systems, plastics processors, and chilled water needs for the automotive and pharmaceuticals industries. As energy efficiency and the environment gained in importance over the last several decades, the gas industry and manufacturers made significant advances in engine technology, microprocessor controls and engine-compressor compatibility. The result is the availability of standard packaged industrial refrigeration units in a market dominated by custom-designed systems built to meet individual customer needs. 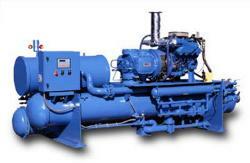 Today’s natural gas engine-driven refrigeration equipment is especially beneficial where there is a need for heat recovery for container sterilization, general cleaning purposes, space heating and other thermal energy uses. Nearly one-half of the fuel’s heat can be recovered, largely from the engine jacket water or from the exhaust gas heat. For the thousands of supermarkets in the U.S., new gas engine applications and hybrid gas/electric systems for refrigeration cases promise energy savings, reduced electric demand, and reliability during power outages. Although engine-driven technologies are well suited to meet the need for industrial or commercial refrigeration, absorption cooling, steam-turbine and hybrid systems, and humidification control technologies are addressing the specialized needs of certain industrial and commercial operations. The technology links to the right provide more information about the different options available and how each can be applied to business needs.